It's all Martha Stewart's fault. Or maybe just inspired by her. When we first purchased The Compound, back in its mini-pound stage with creaky floors and crooked walls, we knew a remodel would be in our immediate future. Not quite the tear-down and rebuild-while-living-in-it job it turned out to be, but that it was going to need some attention. It's most redeeming features were largely external; some nice trees, and brand new shutters in a colonial blue color that was a perfect compliment to the flat horizon and enormous blue sky that enveloped us on all sides. We thought about how we wanted to shape the house, how it should look. It was, and is, tiny. I couldn't understand why God gave us such a tiny house until the baby arrived to show me. That sounds strange, but now that our Duckling has grown into an active Little Mister, with his mini tool belt full of plastic wrenches and hammers, I couldn't keep up with one more square foot. It would just be one more dirty square foot that I would agonize about never having time to clean. Like that dirty spot behind the sofa you know about, even though no one else does. You think about it and it grates. What, it doesn't? Well good for you, you're one up on me. I had picked out the perfect pallete of colors to paint our walls and trim. Something from a special Martha Stewart collection of paint colors. We bought one gallon of something called "Cake stand blue" to experiment with, and promptly lost it in storage as walls were torn down and the weeks turned into years. Can you imagine a more perfect name for a color? Oh, I'll find that paint can someday, you wait. Now, when the time came to really paint, I pulled out the swatch and drove to the Big Box Hardware store to make the buy, only to discover a lot has changed in five years. Martha is a fickle franchise, and she left that store years ago and her colors were permanently retired. Now what? Days were spent taking my aged Martha Stewart color card to different stores in order to come up with the best possible match. This is what life had come to, driving around holding up a paper with an inch of color on it, trying to capture what I loved most about being here, trying to capture all the light and goodness with just the barest, hint of a delicate blue. I examined colors called "Daylight" and "Robin's Egg" and "Snowcap" and of course, "Sky". A lot has changed in five years. I feel growth on the horizon and have been thinking about changing the name of my blog. Not only am I no longer working as a librarian, I can't even get to the library. Much to my shame, I don't even get much reading done. It feels time for a fresh coat of paint around here. So, I'm considering a name change for my blog, and am open to suggestions. Meanwhile, there are still walls to paint, and cabinets being built, toy screwdrivers in the laundry, and pies to bake. It's our own color swatch, and it can't be matched. Hey maybe have a name my blog contest? I understand on the paint colour issues, and yep MS is a very fical business.. but did she not have some pretty colours in her hay day! It drives me crazy when a color I love is discontinued so I feel for you and what you went through trying to match it!! On a side note.....I am one of those people who will move an entire sofa to get that dirty spot behind it......smile!! Hey, how about using the title of this particular post as the new name for your blog....."Changing Skies and Fresh Coats"........hmmmmm........has a nice ring to it, don't 'ya think?? It's really too bad Robert McCloskey has already used the title, *Make Way for Ducklings*. Another great blog posting! Absolutely love your concluding, and very quotable, "It's our own color swatch, and it can't be matched." PS: Auntie Linda wants a picture of the Little Mister in his tool belt! 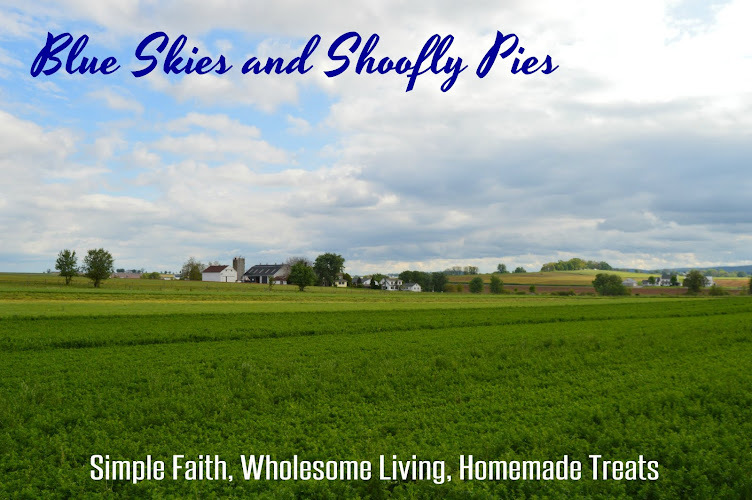 "Blue Skies and Shoo-Fly Pies" is a great idea! Did you just put that there seconds ago? I missed it the first time I read this! It's a recent by-line, and a contender. :) Great minds thinking alike over here. You and me both agonizing over the hidden dirt?! LADY! Yet one more way we are sisters separated at birth! Can I tell you again how much I love you?! An army could lay claim to that widely used term. :) I have to pass because I'm not interested in being a "mom blogger". Someone more deserving should get it. "I couldn't understand why God gave us such a tiny house until the baby arrived to show me." I grappled with this concept in my own life on a different aspect and scale. I came to understand Romans 8:28 from a different light and Praise God for it." "Not only am I no longer working as a librarian, I can't even get to the library." I wouldn't change the name of your blog. I have found out that over the years, those things that define who we are, or more specifically, have impacted our lives and therefore are part of who we, are do not change. As your child grows and develops, being a librarian will have a special and sweet effect on your son and yourself more than you realize. Those areas that I developed before children, and continued to develop after children, did have a very positive effect on my six children. I drew on those areas on my life as well as others; without question my spiritual life and relationship with The Lord were, and are, most paramount. They are all adults now, but they appreciated those special aspects of who I am via my parenting. Being a librarian will always be a part of who you are and it will be special to your son when he gets older. It will become part of his lifelong experiences as well as yours. Really. Thank you Mrs. R., that was very insightful and gave me a lot to think about. Please don't change your name! I suppose you could ADD to it, though..."The Mennobrarian - Striving for Sanity"...you know, something like that! Bill had an idea but I don't remember what it was. I don't remember many conversations anymore BUT I have been reading! I'll ask him; if I remember. Oh v in Idaho, you need to get some sort of award for sticking around for so long. Good to hear from you! I'd have to think about this. You know I love playing with words (titles, etc.). But it sounds as though folks rather like the name you've got.